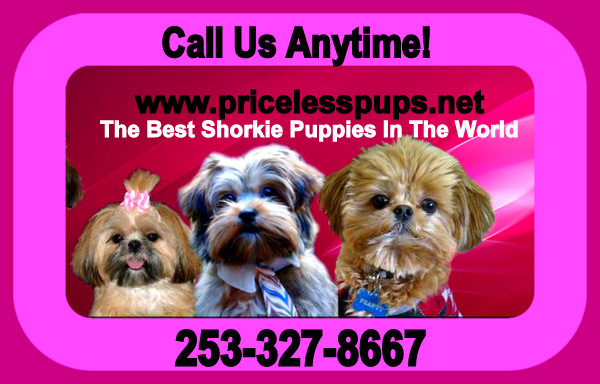 At Priceless Pups we liken raising a puppy from birth to 12 weeks of age to that of raising a child from birth to 5 years of age. The social and environmental interactions that a child experiences the first five years forms the basis for how he or she perceives and interacts with the world around him or her. We believe our 24 years experience and how we raise our Shorkie puppies influences how they perceive and interact with their world. Which clearly sets us apart from many breeders. We raise our pups with a balanced mix of science, nature and experience. We seek to have as natural an upbringing as possible for our puppies while inserting important experiences at development-appropriate times. We provide as stimulating an environment as possible as the pups' physical and mental development allows them to engage. We do not want to do too much too soon but we want to stretch and challenge the pups, both physically and mentally, as they grow. We strongly believe that we can actually increase the size and complexity of our pups' brains by the things we do with their dam before they are born and the pups themselves after birth. We then increase the complexity of their environment once their eyes and ears open, they become more coordinated and their minds can handle problem-solving. We let them get themselves in and out of trouble, solving their own problems, while ensuring their safety. All of our efforts focus on making each pup the best that it can possibly be. Please understand.. Our dogs sleep in our beds every night and go every where with us. There are always two or three dogs with me at all time and everyone from Starbucks to the football team at my sons high school know our dogs. This is my passion not my job! They are our children with FUR! and we treat them as such. While these stages are important and fairly consistent, a dog's mind remains receptive to new experiences and lessons well beyond puppyhood. Most dogs are still puppies, in mind and body, through the first two years of life. Check this out... What a miracle !!! Puppies are born deaf blind and toothless and so they rely on their mother for everything. They cannot regulate their won body temperature at this time and why we use a heating pad under the bed for them for the first 4 weeks of life. 3 to 5 weeks: puppy becomes aware of his surroundings, companions (both canine and human), and relationships, including play. 4 to 6 weeks: puppy is most influenced by littermates and is learning about being a dog. 4 to 12 weeks: puppy remains influenced by littermates and is also influenced by people. Puppy learns to play, develops social skills, learns the inhibited bite, explores social structure/ranking, and improves physical coordination. 5 to 7 weeks: puppy develops curiosity and explores new experiences. Puppy needs positive "people" experiences during this time. 7 to 9 weeks: puppy is refining his physical skills and coordination, and can begin to be housetrained. Puppy has full use of senses. 8 to 10 weeks: puppy experiences real fear involving normal objects and experiences; puppy needs positive training during this time. 9 to 12 weeks: puppy is refining reactions, developing social skills with littermates (appropriate interactions), and exploring the environment and objects. Puppy begins to focus on people; this is a good time to begin training.